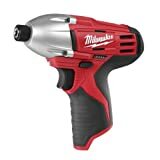 Powerful yet compact, this Milwaukee is a well-balanced impact driver. It is very light-weight, yet feels solid while in hand. Although it doesn’t have the highest torque in its class, thanks to the battery life and overall performance you won’t even notice. Add on an LED headlight and a battery fuel gauge and it makes for a great addition to the Milwaukee M12 line. If you are looking to get a good, all around impact driver for the first time – or the fifth time – you wouldn’t be making a mistake by picking Milwaukee’s 12v offering. Like most impact drivers, it works great with almost any kind of screw-driving application – faster than a drill, and far less chance of cam-out stripping the head. And all that while working 1 handed with little downward pressure. The 2450-20 is very lightweight, making it easy to work in overhead applications, or for long periods of time without fatigue. As you might expect from an impact driver, there is virtually zero back torque on your wrists while driving screws or lag bolts. This lets you work faster and safer, whether at home or on a job site. At 6 1/2″ long, however, it is larger than some competitors like the Bosch PS41. If you need a super-small driver, this one might not fit the bill. That being said, it’s still much, much smaller than a drill and will absolutely let you work in tight spots. Performance-wise, this cordless impact driver is excellent for its size. Being a 12v driver, it’s not going to be optimal for driving large screws into concrete or masonry, and it probably won’t take stuck lugs off your car wheels. But for anything less than that, you will see solid, quick work. At 2000 rpms, it doesn’t have the fastest rotation in its class. But if you need to drill pilot holes, get some hex-shaft drill bits and you will be just fine. With the one-handed “quick change” chuck, you can quickly switch from drill bit to driver bit and back again. Milwaukee’s M12 and M18 new Red Lithium battery lines are some of the best available. You can drive over 100 screws on a charge, and still have some power left for tightening some nuts down. (If 100 screws doesn’t sound like much, give it a try some day!) While you may need more power than that on a job site, for most weekend-warrior types, it is more than enough. Recharges in under 30 min. Battery fuel gauge on the side of the driver body indicates approximately how much life is left. Front LED light when the trigger is pulled, to light up your work. Variable speed trigger, w/forward and reverse switch. There is no bit storage on the tool. While it’s very compact, they probably could have found room for one. It is slightly longer than others in its class, making it not as maneuverable. Milwaukee tools are known for being tough powerhouses. Although, spec-wise, it’s not at the top of the 12v impact driver class, it is still a great tool that will handle 85% of driving and drilling tasks most people will encounter. It’s rugged, and comes with the 5 year Milwaukee warranty. If you want a small driver to replace that big cordless drill, and you want tough, reliable performance, the Milwaukee 2450-20 will deliver. This entry was posted in 10.8v / 12v, Milwaukee and tagged 12 volt, li-ion. Bookmark the permalink. Both comments and trackbacks are currently closed.